The event titled, REBOUND: A New Start, New Connections, will focus on informing the public of the opportunities available at the Center. 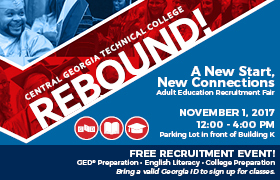 Information about the GED® program and testing, workforce innovation opportunities, dual-enrollment, English Literacy Program (ELP), and e-portfolios for job readiness will be distributed to attendees. During the event, students and staff will share their success stories and work of the Center in the community. 97.9FM will be on-hand for live-remote promotion, and the Center will have food and giveaways for participants. The event and services of the Center are at no cost to students. Participants will be able to complete on-site enrollment and orientation, talk with active staff and students, and possibly start school on the next day. Anyone interested in enrolling should bring valid Georgia identification. For more information, contact, Dr. Wanda West at wwest@centralgatech.edu. This entry was posted in 2017 and tagged Accelerating Opportunities, Adult Education, GED, graduates, jobs, literacy, REBOUND, Wanda West. Bookmark the permalink.